"I am a 3D Artist and Digital Sculptor from Colombia. I have been working as a freelancer mainly in character development for over 10 years. I am a big fan of sci-fi, action and fantasy genres and the CG characters always have been my source of inspiration. 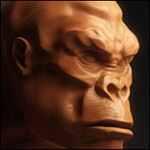 Currently I work as a ZBrush instructor"